Swen Waterreus sends us this update on the current state of sustainable tourism in Cuba, a country whose slow opening up to international markets and massive economic needs have attracted much attention lately. Community tourism is particularly strong in Cuba, and Swen takes us to Las Terrazas, a tourism development and destination which has become exemplary for pioneering sustainable tourism in Cuba. The sustainability of destinations is emerging as a major topic and potential concern for place developers, managers and marketers keen to develop or maintain destination reputation and competitiveness. For the average tourist treading the lands of Cuba, sustainability is not the first thing that catches her eyes. The more adventurous tourist who travels the country on own initiative and not in organized tours learns quickly to be thick skinned. If tourism was meant to bring prosperity to the island, the question that comes to mind is: to whom? A good share of haggling skills is required when visiting Cuba, as well as patience. Cuba gives the independent tourist the constant notion of being squeezed. Many tourists avoid this by choosing to stay in all-inclusive hotels instead. Hotel chains, especially the international ones, do take visible efforts for sustainable practices. Ever since the re-birth of tourism in Cuba in the 1990s, the focus has been on obtaining “hard” – foreign – currency. Along the northern coastline, large hotels were constructed without attention to environmental impacts, let alone cultural and social considerations. It is only since a new law (Ley 81) passed in 1997 that Cuban authorities specifically define sustainable tourism. According to this law (also known as Ley del Medio Ambiente de la República de Cuba), the focus is on mitigating negative impacts through strict regulations regarding power usage and import of produce, and focusing on ecotourism as a way to leverage from its rich natural heritage consisting of six UNESCO Biosphere Reserves, six Ramsar sites and nine World Heritage Sites. This short introduction illustrates that Cuba is just starting to embrace sustainability and sustainable tourism on a strategic level, with most initiatives so far the result of grassroots projects. Las Terrazas is one of Cuba’s leading sustainability showcases. Seventy five kilometers west of Havana, right off the national motorway to Pinar del Rio, lies Las Terrazas. A small picturesque village named after the terrace land form that was built to avoid further erosion of the hills. In the 1960s, this entire area was completely desertified after heavy logging during past decades. The inhabitants lived very dispersed and in precarious living conditions. The new socialist government wanted to demonstrate the Revolution and its capacities and introduced the Plan de Desarrollo Integral Sierra del Rosario. The brain behind the project is nobody less than Osmany Cienfuegos, brother of the famous revolutionist hero Camilo Cienfuegos, who died in the battles of 1959. The first objective of the plan was the reforestation of 5,000 hectares of the Sierra del Rosario and the regrouping of the area’s inhabitants. Also the connection to the national road network and access to education and health was of primary concern. 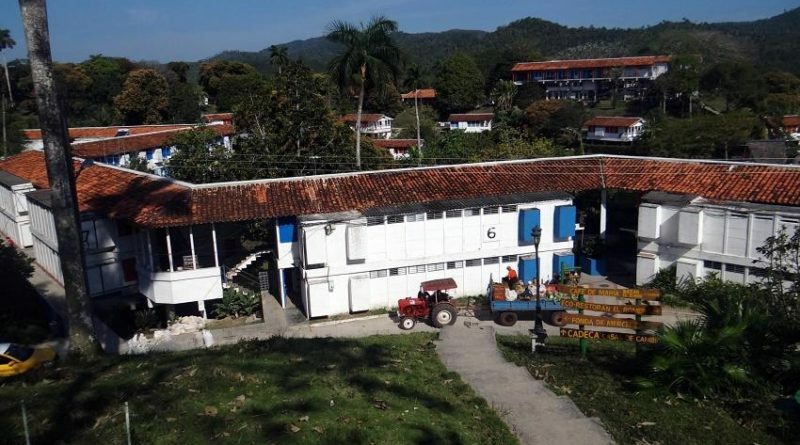 The year 1971 marked the birth of the new town of Las Terrazas with forty-five houses for those campesinos who lived in the worst conditions. For the construction of these houses they listened carefully to the desires of the people allowing the new homes to be as comfortable and similar to the comforts of their old homes. At the time of inauguration, the town offered a school, a health clinic and work in continuous reforestation and agriculture. It was such a success that a second construction phase was planned and in 1975 the number of inhabitants started growing. Today the community is made up of 273 families and 1,300 inhabitants surrounded by a total of over six million planted trees. 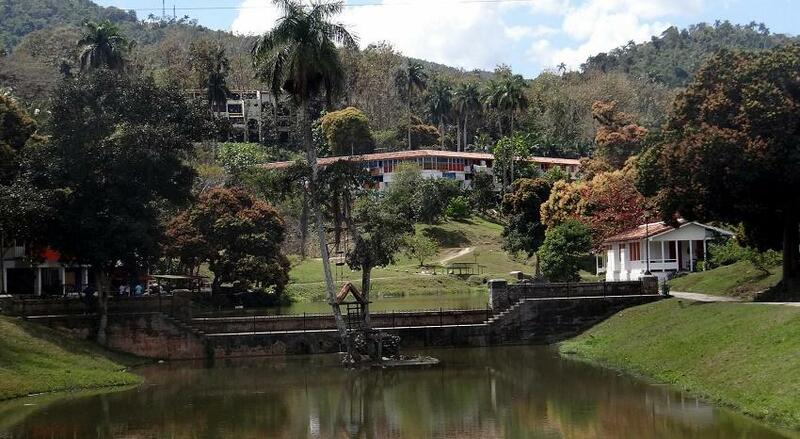 Las Terrazas is constructed around a small lake and surrounded by the Biosphere Reserve. When in 1991 the Soviet Union fell, it had devastating effects on Cuba’s economy. The following years Cuba went through a very rough period of economic hardship, known as the Special Period in Time of Peace. A few years earlier, in 1984, UNESCO had declared the 25,000 hectares of the reforested Sierra del Rosario as the first Biosphere Reserve of Cuba. The authorities found an economic alternative for Las Terrazas in the Special Period in the increased attention for nature-based tourism and ecotourism. Tourism was to be the savior for Las Terrazas and in 1994 opened the four star Hotel Moka with 42 rooms with view over the village. After arrival in town, visitors have much to choose from. The area is home to ruins of coffee plantations from French colonial times connected by many hiking trails through the reserve with a local trekking guide. The woods offer bird watching and an observation tower. There are waterfalls, natural pools and a lake with water sports. One can also explore the local nature by horseback, bicycle and even by zip line. Besides the hotel and private home stays there is a camping and a handful of local restaurants. 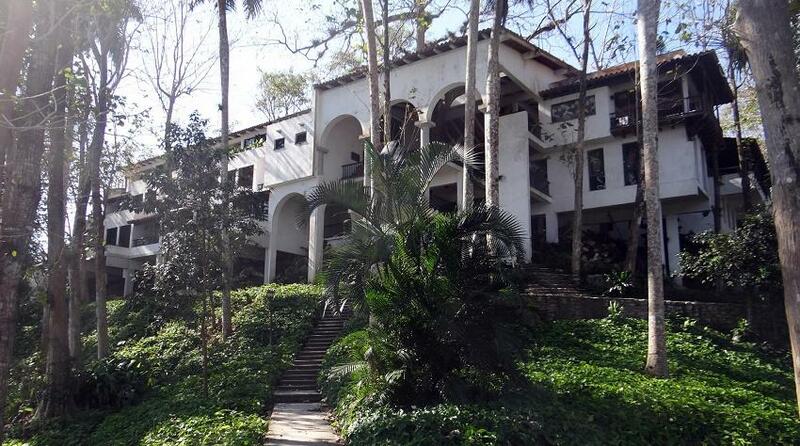 On the cultural level, there is the house of Polo Montañez, a famous singer who died in 2006 after living all his life in Las Terrazas, a handicraft market and the studios of a number of local artists. Each and every one in Las Terrazas agrees. Tourism here is the backbone of the community project, even though it is not in the first place for tourists. “Our first priority is always our own community. Everything that we have to offer is in the first place for ourselves. Visitors are more than welcome to enjoy it too”, comments Dennelys Fuentes Baez, the community development director. With that vision, they are unknowingly following one of the primary sustainable destination principles: first create an attractive living space for inhabitants, then visitors will come automatically. The entire community now runs on and around tourism. The community is essentially a social project that responds to its own necessities that sustains, finances and governs itself. The Moka hotel and all other tourist activities pay between 16 and 20% of their income to the community fund. It is the community – not the state – that owns all the houses. The inhabitants never had to pay a single peso for their home. All matters big and small have to pass through the ‘neighbors council’, meaning there is a great deal of social control. In the words of the community director, “a problem between two neighbors is a problem of the entire community”. The community fund, fed by tourism income, is used for literally all communal matters. The maintenance of the coffee plantation ruins comes from this fund, just like the collection of waste and the management of the garbage disposal site, public cleaning, capacity building for tourist workers, sustainability investments and even an elderly home called the House of Memories. In Cuban society it is the state that provides free education, health care, basic needs and social facilities. 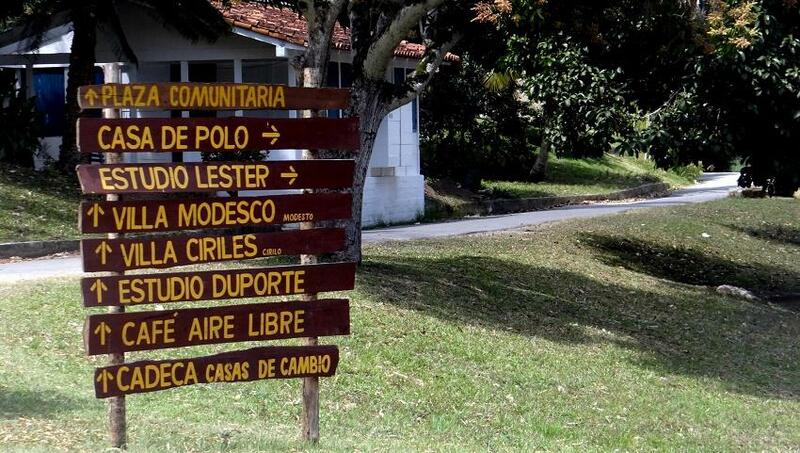 Also in Las Terrazas these services are freely available. “But because of the community fund, the school, clinic and public facilities are better maintained and doctors and teachers here can give a little extra attention and care to the people”, explains Alejandrina Naite Cabezas, general manager of the Hotel Moka. The governance construction of the project follows very advanced principles of sustainable community governance. It is run by the Consejo de Vecinos, or Neighbors Council, that consists of thirteen members. Eight of them are democratically elected by the population and the other five are the director of the complejo, the director of Community Development, the director of the school, the representative of the health clinic and a delegate of the poder popular (local government). This results in a very strong sense of belonging among the inhabitants. It is one of the few places in Cuba where the people govern themselves democratically and where communal issues can be brought under the attention of the decision makers personally. 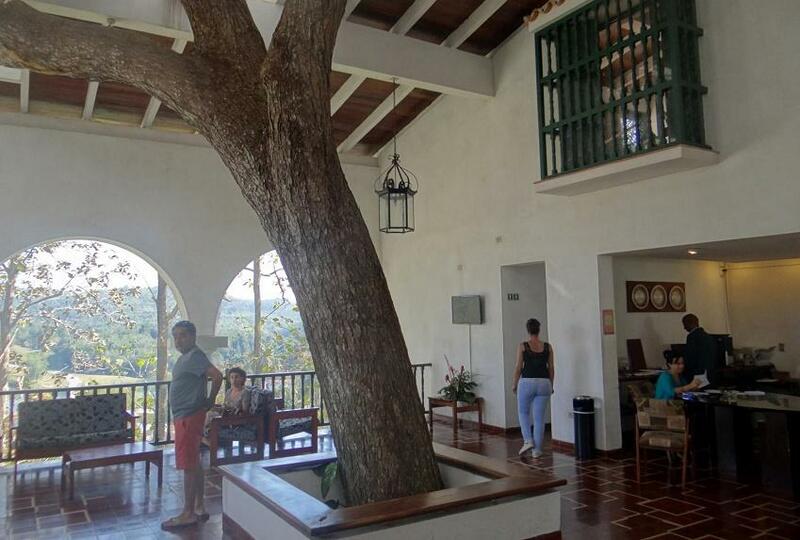 Compared to the stress of Havana and the general hassle of traveling through Cuba, Las Terrazas not only is Cuba’s best practice of sustainable tourism, but also offers the visitor a wonderful and calm stay in a natural environment with ample activities to enjoy. 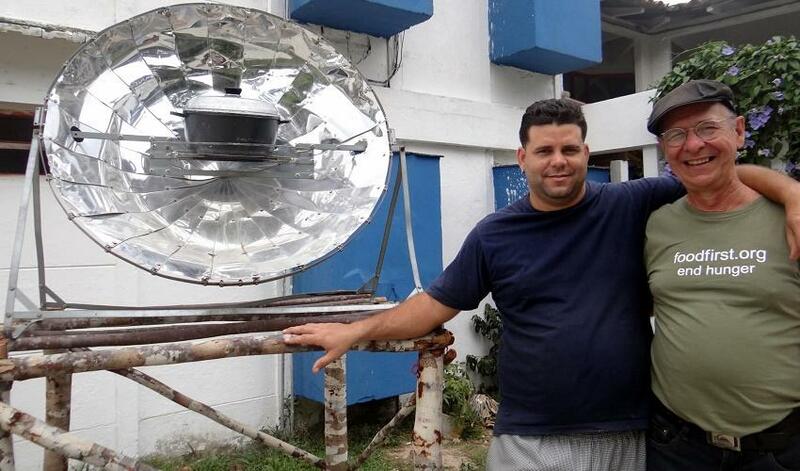 Already a very successful and unique community project in itself, considering that Las Terrazas is in a communist country where private initiative is not incentivized, private property is not allowed, all economic gain is claimed by the state and all entrepreneurship is state-owned, this project truly is a revolutionary and unique case of collective ownership and democratic self-governance. According to general sustainability principles, true sustainable practices are only realizable when local communities are involved in decision-making processes. What makes Las Terrazas so unique is that it has achieved this in all respects, even though this is not common (and probably not desirable) in the regular Cuban communist system. Of course, the question remains to what extent true sustainability is achievable and replicable in the current political system, but Las Terrazas as a destination leads the way in Cuba’s course towards sustainable tourism. Before starting his Master in Leisure, Tourism and Environment from Wageningen University in his homeland the Netherlands, Swen travelled extensively and worked in tourism in over eight countries. For his master, he worked on large projects in Nicaragua and Gabon. His passion for travel and the knowledge of his masters degree led to his tourism research consultancy, which led him to Kenya. 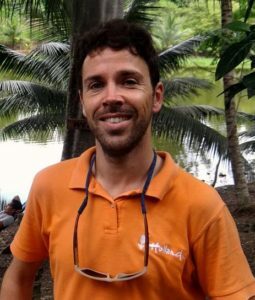 Swen is currently working as a tourism lecturer and researcher into sustainable tourism practices at the Inholland University of Applied Sciences in the Netherlands. Previously he worked as a tourism teacher and researcher for a small university in coastal Ecuador, where he taught ecotourism and environmental subjects, and researched the role of tourism in local biodiversity protection, among others. This article was originally written for and published by the Sustainability Leaders Project. Enjoyed this guest post by Sven Waterreus on the current state of destination sustainability and sustainable tourism in Cuba? Spread the word!